Want to be notified of new releases in aak1247/shell-set-up? Pull request Compare This branch is 4 commits ahead, 2 commits behind Thrimbda:master. 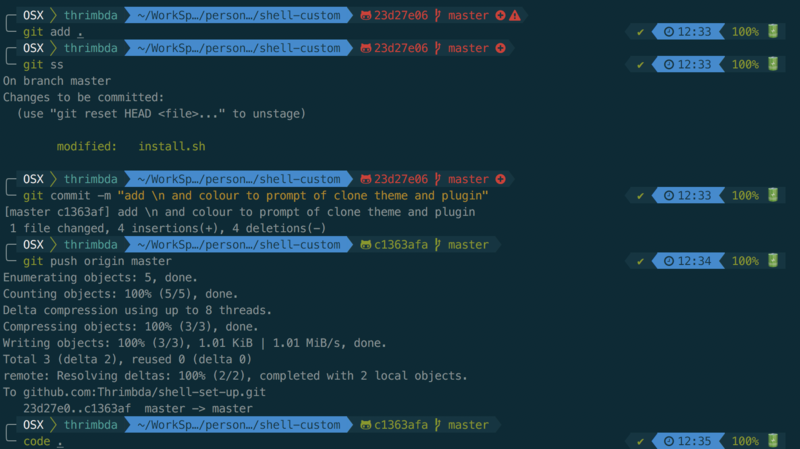 my personal shell set up script. it's basically a customed adaptation of oh-my-zsh install script. sh -c "$(curl -fsSL https://raw.githubusercontent.com/aak1247/shell-set-up/master/install.sh)"
sh -c "$(wget https://raw.githubusercontent.com/aak1247/shell-set-up/master/install.sh -O -)"
if you want to adopt my configuration, you can replace DEFAULT_USER variable with your username in .zshrc and uncomment it if you want (default is $USER@$HOSTNAME). finally, Do remember install an powerline+awesome(nerd) font (here is meslo which I am using) to show all these wonderful stuff!